----more---- A small disclaimer: as well as hosting this show (UTalkRaw) I also hold volunteer posts helping out the GB U23 program and on the UK Ultimate oversight committee. 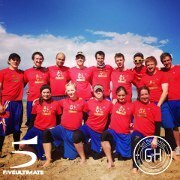 However, UTalkRaw is completely separate from the GB program and UK Ultimate - nothing said here is official in any way. This is an unedited, off the cuff conversation, so do be kind to us :) This podcast ends with the song Magic by White Wires, available under a Creative Commons Attribution-Noncommercial license.